Is that title too pretentious? Ha, oh well if it is. It describes pretty accurately my thoughts at the moment. This post is about me and where I came from to be who I am as a sewer today. Her daughter, my Grandma Myrna, is also wonderful. She started having children in the mid-fifties. It was still somewhat necessary to sew clothes for your family and I've always thought of her sewing career as completely practical. 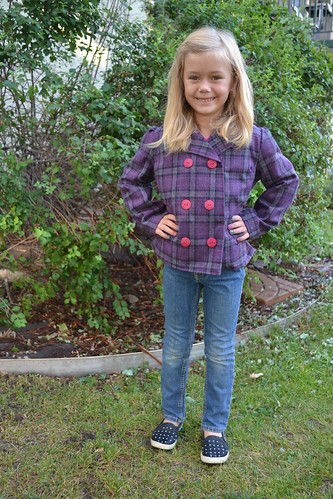 However, when I showed her this picture of the coat I recently made for my daughter, Lorelai. She became happy and reminiscent and told me about sewing blue coats for her little girls and how much she loved making them. 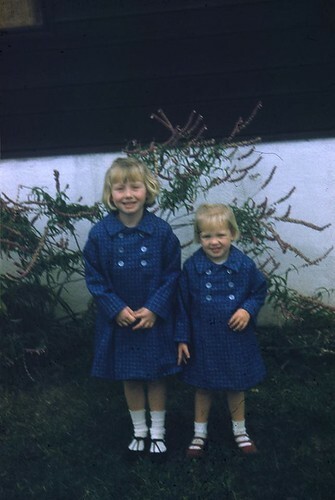 My uncle sent me the picture of my Aunt Susan (on the left) and my Aunt Donna (right) and I think it is such a treasure. Susan died of leukemia a couple years after this picture was taken. Donna grew up to be a very petite teen that couldn't find clothes in the department store that fit right so in high school she took to sewing all of her own clothes. At 17 she took a job at Macy's fabric department in order to facilitate her sewing and has worked there ever since. My dad is her younger brother and learned to sew in the army during robotics training. How cool is that? His twin brother Roger is a ventriloquist and sews his puppets and their gear. Roger's daughter Emily is two years younger than me and the cousin I am closest to and easily one of my best friends and a sewing friend! Funnily enough after all that about our father's side of the family we were each taught to sew by our mothers. I love that so much. I love that I've known how to sew longer than I can remember and I love that I am now teaching my daughter to sew. It's not a hobby it's a legacy. Thanks Everyone for reading. I'll be back Friday to talk about what I like to sew, my routine, and sewing space. I have a blog, Banana Cherie, that I've neglected since my son was born but I plan on getting back into it. 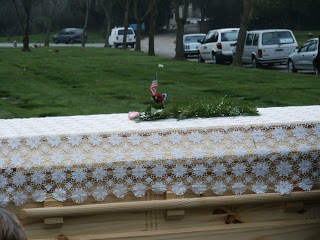 Writing this post for 52Quilters has reminded me how much I've loved blogging. There is still plenty to check out over there. 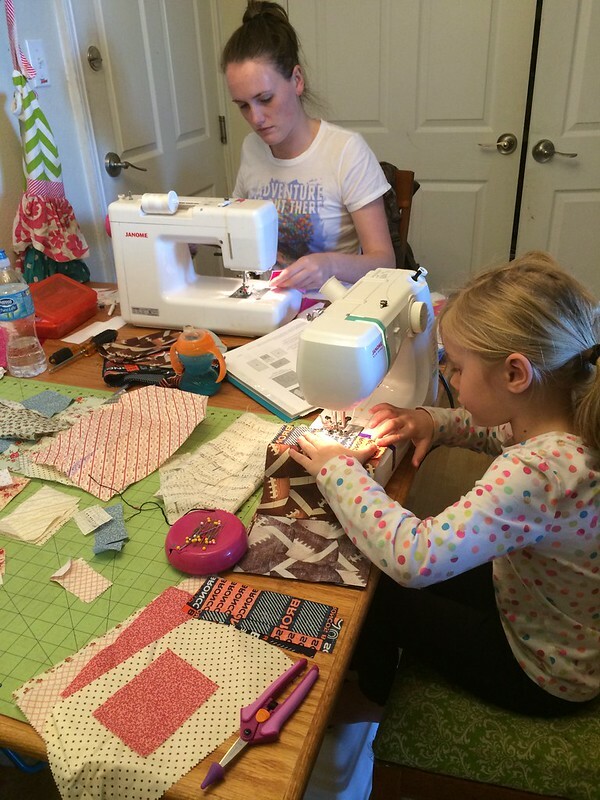 Have you taught anyone to sew? Lisa's mom taught her how to sew, and she's been sewing for as long as she can remember. Lisa started to sew more regularly when her daughter was born and is now passing her skills on and teaching her to sew. Lisa loves bright beautiful fabrics, clever patterns and getting to know fellow sewing enthusiasts! Find her on Instagram at @Sew_l1sa.